Upgrade your 79-95 Ford Mustang stock rocker arm studs with the ARP High performance 7/16"-20 1.9" rocker arm studs from Late Model Restoration! ARP High Performance series rocker arm studs are ideal for ET bracket racing, limited rule oval track competition, and street use. They are made from 8740 chromemoly steel and are heat-treated to 180,000 psi tensile strength. These studs are concentric within .005 T.I.R. thread pitch to thread pitch, which will give you more consistent rocker geometry. With an extra-large radius base, these studs are more resistant to flex and will provide a more positive seating. These 5.0/5.8L rocker arm studs are designed to be used with Perma-Loc adjusters (not for use with OEM-style, self-locking nuts). ARP’s product line contains thousands of part numbers, and has expanded to include virtually every fastener found in an engine and driveline. These range from quality high performance OEM replacement parts to exotic specialty hardware for Formula 1, IndyCar, NASCAR and NHRA drag racing and marine applications. 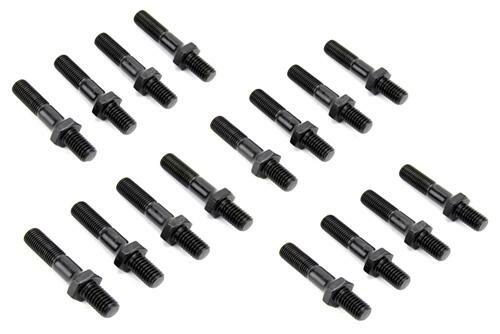 Shop ARP's Mustang water pump studs, water pump bolts, wheel studs, head stud kits, oil pan bolts, motor mount bolts, and many other hardware kits.